You are here:Jamie's Blog > SharePoint, SQL > SharePoint Report Error: Cannot create a connection to data source ‘dataSource1’. SharePoint Report Error: Cannot create a connection to data source ‘dataSource1’. 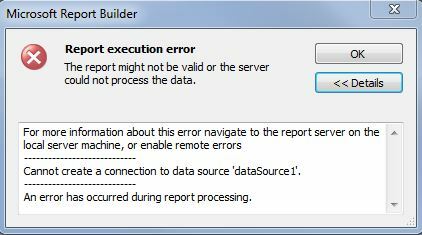 You recieve the following error when running a report from report builder. Report Execution error the report might not be vaild or the server could not process the data. Cannot create a connection to data source ‘dataSource1’. An error has occurred during report processing. In my case the problem was the login that was used when running the report did not have access to the catalog and the sql server. I granted the correct access to the databases in sql manager and the user was able to run the report. Great article. You should add that the report user id needs access to the Master catalog of the reported database.